With the advent of telemedicine and increasing popularity around teletherapy, we set out to demonstrate, once again, that non-traditional methods like teletherapy can help adults with aphasia improve. Working with our partners at the Synder Center for Aphasia Life Enhancement (SCALE) in Baltimore, Md., we decided to determine whether teletherapy delivered in two forms—live and automated—would be an effective treatment option for adults with chronic speech conditions. We defined “live teletherapy” as a patient working with a speech-language pathologist and “automated teletherapy” as a patient interacting with an automated therapy service. Our study with SCALE is the first clinical outcome study to combine these two types of therapy together. Our team structured the study to include nine participants with long post-onset aphasia. 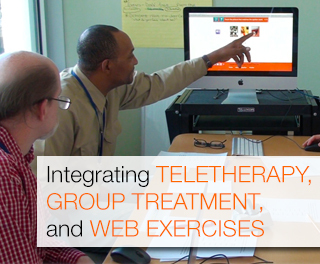 Every week for 12 weeks, the participants engaged in live teletherapy with a clinician located more than 1,000 miles away in Winnipeg, Manitoba. For 12 weeks, the participants received 18 live group therapy sessions and three one-on-one live sessions. In addition to the live therapy, participants used automated therapy with Lingraphica’s TalkPath Online Speech Therapy solution—both types of therapy were supervised by a certified speech-language pathologist for the entire study. Therapeutic diminution of impairments – participants showed decreased speech impairment. Practical improvement in functional communication – everyday communication improved by the end of the study. Gains in participants’ communicative confidence – caregivers, loved ones, and our teletherapist reported notable improvements in the participants’ communication confidence. High levels of participants’ satisfaction with the experience – caregivers, loved ones, and participants all conveyed happiness and satisfaction with the program. With our encouraging findings we hope to increase access to teletherapy treatment options for more adults with aphasia and demonstrate the beneficial role of automated therapy through platforms like TalkPath Online Speech Therapy. If you would like to learn more about our study or speak with me or one of our clinical partners at SCALE, please email us. You can read the entire study here.